This was a ‘first’: we discussed this book with the author present and it was one of the longest sessions we have had. It was generally agreed that there was a good balance between the local and the national in terms of movements and events. 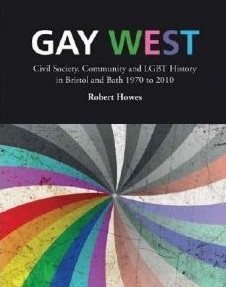 As well as being a social history, the book sets out to explore the relevance of social groups such as GayWest. The organisation started up because the Campaign for Homosexual Equality was deemed to be ‘too political.’ As someone on the left of the political spectrum, I tend to agree with those who say that ‘the personal is the political’ and with someone in the book who said that ‘However good your Victoria sponge, that in itself won’t achieve equality.’ However, my politics have mellowed over the years and I accept that many of the men, as the book points out, who attend earnest GayLib meetings in the 1970s were really there for the companionship so GayWest performed a very important function. Indeed, meeting in a public space is itself a political act; for some it requires considerable bravery. And it is unfair to write them of as ‘Tupperware queens’ or to call them ‘Grey West’, given that older men aren’t made to feel particularly welcome on the commercial scene. It is an oddity of history that GayWest flourishes in Bath, even though a majority of members live in Bristol. (Maybe the MacArthur’s Warehouse had something to do with it – it was Bristol’s attempt at a Gay Centre in the 1970s, which was well-run by a hard working band of volunteers but which was set in an out of the way place with little street lighting – not the place to walk to after dark unless you enjoy the sense of frisson of thinking you might get mugged.) There was an exception in the 1980s when a particularly gifted woman chairperson and her committee put on a diary of almost daily events, many of which were in Bristol and attracted large umbers of women in what has tended to be a mainly male group. Many of these meetings were active: a Sunday morning walk to pick wild mushrooms, ten pin bowling: an antidote to the Saturday coffee shop with its seemingly endless discussion of house prices in the South West. One sadness: that Ernie Everest should be honoured to be invited to a royal garden party but get snubbed by Prince Philip on account of his representing gay people.